What king of place is this? “The story has its origins, however, in around 1650, when traveller Richard Ligon met a female Amerindian slave in Barbados and returned to England to write A True and Exact History of the Island of Barbados, telling of “poor Yarico” who “for her love, lost her liberty”. It’s a musical. Don’t know what to think about it because I haven’t seen it, but I lost my liberty for love one time. Lost a house too. Somehow, I don’t think that’s what they are talking about in Yarico. Jodie’s quotes in the Guardian are interesting because they totally ignore the issue of white historical privilege in Barbados. Yes… we’re free, but the old boys still control the money and the economy… and where they don’t, the new black political elites are gaining fast. The ordinary man, especially the light skinned mixed-race man, has not progressed in Bim since about 1960. That’s my story and I’m sticking to it. There was a time on this rock when governments, both colonial and post-independence, did everything they could to erase every vestige of our origins. It was almost as if some people thought we could progress only if we forgot about the past. What foolishness! Our government left gorgeous plantation houses and noble public buildings to rot – forgetting (or maybe not forgetting) just who built these structures: slaves and the children of slaves. Not satisfied with destroying historical buildings, they also let the humidity, salt air and rot take care of books, letters and historical objects. The destruction was so long term and widespread that it simply must have been deliberate. It is true to say that much of Barbados history has faded away irrecoverably – gone forever. So it is that when I see a tangible bit of Bajan history I get excited, because I know that with a little bit of work on the internet I will discover so much more about this piece of soil where my navel string is buried. 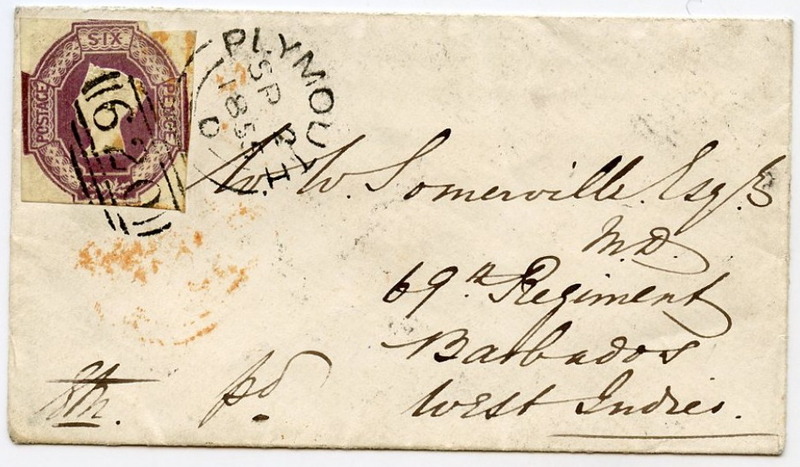 Today’s discovery is offered by Scotia Philately – a letter to Medical Doctor W. W. Somerville of the 69th Regiment in Barbados, West Indies postmarked September 2, 1855 at Plymouth and stamped received in Barbados on September 21, 1855. That’s nineteen days from England to Barbados, a distance of 3504 nautical miles for an average speed of 7.5 knots postal stamp to postal stamp. Meaning that the Royal Mail sailing vessel probably averaged over 10 knots on the journey. Clippers (fast sailing vessels on the mail and opium runs) could easily make 13 or 14 knots and maintain that speed in all but the worst weather. How Bridgetown built the economic foundation of the British Empire – only to be discarded when the profits were gone. 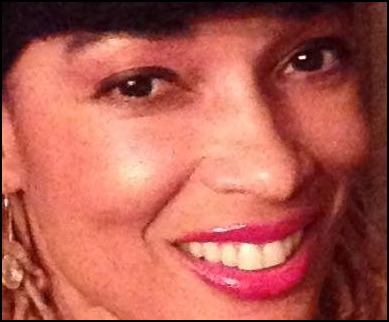 Slavery Reparations have never interested me because I know that whatever we receive will never be enough for the victims class, and that anything we do receive will be stolen by the political class. No reparations will ever touch my hand. No amount of reparations will provide a steady flow of clean water from my pipes or establish a modern sustainable economy. Britain could pay us 10 billion pounds and not one new hospital bed or surgery will appear at that slum we call the Queen Elizabeth Hospital – or anywhere else. A trillion pounds will not erase the arrogance of government employees towards citizens, nor will it cure the ‘Island Time’ syndrome that makes foreign business investors run like mad from the Caribbean once they get over the rum, sun and sand. Barbados is incapable of receiving and delivering reparations honestly and effectively for the general good. Whose fault is that? I’m not sure, but I do know that at one time Barbados was the driving economic force and secure military base that built and maintained the British Empire. Whatever Tristram Hunt has written in his new book Ten Cities that Made an Empire, he’s probably 50% correct and 50% nonsense. After all this time, who can say? But I look forward to the read. Barbados Today is reporting that the government is selling the abandoned Barbados Four Seasons hotel project to a Qatar-based investment group. So let there be no misunderstanding about this either: The descendants of Bajan slaves are happy to do business with modern day slavers. Money trumps human rights on this rock, and we’ll do anything to get more. Slavery reparations for Bajans? What a joke. 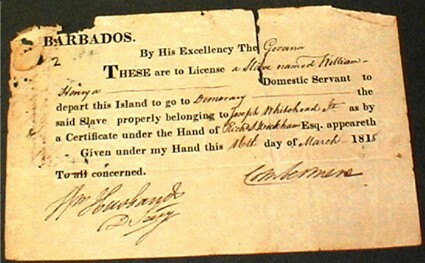 Will Qatar slaves come after Barbados some day for reparations? As we’ve said here from the beginning: Spend any reparations payments to free current slaves. There are more slaves today than at any other time in history; yet Barbados is about to shake hands with Qatar slave owners. “The evidence uncovered by the Guardian is clear proof of the use of systematic forced labour in Qatar. In fact, these working conditions and the astonishing number of deaths of vulnerable workers go beyond forced labour to the slavery of old where human beings were treated as objects.